I tried to Add the 'Secure' attribute to all sensitive cookies and for that I have added <session-cookie http-only="true" secure="true"/> under <servlet-container name="default"> in standalone.xml. 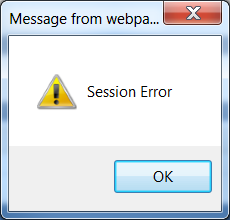 After restarting the Wildfly 10 app server when I logged into the application I am getting "Session Error" popup. How to prevent this popup and add the 'Secure' attribute to all sensitive cookies.